I had lunch with my good friend Ira Wiesenfeld this week. As you probably know, Ira is a field engineer who travels all over the country doing installation and maintenance of radio communications systems. He is always the one that I recommend when someone is looking for help with a paging system. Ira's firm, Ira Wiesenfeld & Associates is rated as one of the top consulting firms in the United States. He has several great associates, including his brother A.J. Wiesenfeld, Jay Thompson, and others. Lunch with Ira always produces several ideas for newsletter topics. He was telling me about the serious interference problems to radio systems in South Florida being caused by BDAs. 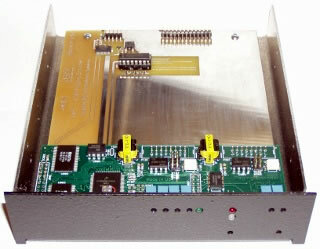 A BDA is a Bi-Dirrectional Amplifier (or signal booster) used to fill-in dead or weak spots in radio system coverage. We used these in Paging to fill-in coverage inside of buildings with tinted windows, where the metalic-tinting inside of the window glass was blocking the signal. The big problem with some of the BDAs in South Florida was that they just about wiped out the radio trunking systems in Broward and Dade counties. That disabled a lot of very important two-way mobile radio systems. They had to use a helicopter to find the offending BDAs. 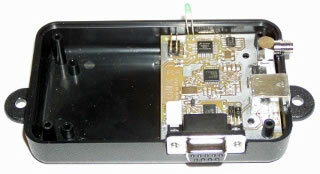 The way a radio BDA works is simple; it receives a signal and retransmits it on the same frequency. This is very different than a conventional radio repeater that receives a signal and retransmits it on another frequency. The problem that happens is analogous to a PA system in an auditorium. There, a microphone picks up a person's voice on the podium, then feeds the sound of the voice into an amplifier, and then to loud speakers so that everyone in the audience can hear. If someone turns up the volume too high feedback occurs. We have all heard that very-loud, ear-piercing, screeching sound when this happens. That's because sounds going into the microphone, then out of the speakers, and then back into the microphone again, get continuously re-amplified up to the maximum ability of the amplifier. It's like a dog chasing his tail. A very unpleasant experience. So the same thing happens when a radio BDA is not installed and adjusted correctly. Feedback occurs, producing very broad (and strong) radio-frequency-interference signals. In my humble opinion (*IMHO*) this happens because of the lack of training of the young technicians and engineers out there doing installations. When I started in this business, I was required to take a very difficult exam, and obtain a FCC first-class-commercial license. Some of these young people today (bless them for trying) don't know the difference between a ground and a door knob. They probably know a lot about computers, and IP, but not so much about RF. Unfortunately the FCC discontinued this type of licensing several years ago. This is an area where Ira and I agree, as we do on most topics. 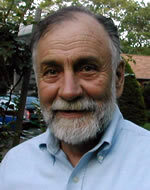 He has co-authored several books, and study guides for engineers, and technicians that should help resolve this problem. Discussing interference reminded me of my favorite interference story. Ira's brother, A.J., solved a very serious interference problem for me when I was managing Motorola's Latin American Paging Infrastructure group. I am hoping A.J. will write an article for a future issue of The Wireless Messaging News with all the details. SPRINGFIELD, Va.—(BUSINESS WIRE)—Jul. 28, 2015—SPOK HOLDINGS, INC. (NASDAQ: SPOK), a GLOBAL LEADER IN CRITICAL COMMUNICATIONS, today announced operating results for the second quarter ended June 30, 2015. In addition, the Company’s Board of Directors declared a regular quarterly dividend of $0.125 per share, payable on September 10, 2015 to stockholders of record on August 19, 2015. 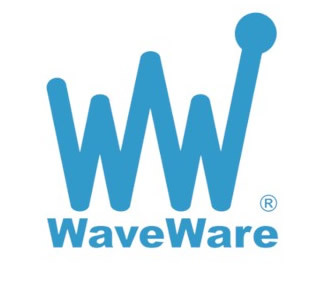 Software revenue increased 13.9 percent to $17.7 million in the second quarter from $15.6 million in the year-earlier quarter, while wireless revenue was $30.2 million versus $33.5 million in the second quarter of 2014. Consolidated revenue for the second quarter was $48.0 million, compared to $49.1 million in the second quarter of 2014. Second quarter EBITDA (earnings before interest, taxes, depreciation, amortization and accretion) totaled $9.1 million, or 18.9 percent of revenue, compared to $11.7 million, or 23.9 percent of revenue, in the year-earlier quarter, and $10.0 million, or 20.8 percent of revenue, in the first quarter of 2015. Net income for the second quarter was $3.4 million, or $0.16 per fully diluted share, compared to $4.3 million, or $0.19 per fully diluted share, in the second quarter of 2014. Software bookings increased 10.9 percent to $21.0 million from $19.0 million in the year-earlier quarter. Second quarter bookings included $10.5 million of operations bookings and $10.5 million of maintenance renewals. Software backlog increased to $43.5 million at June 30, 2015, compared to $40.2 million a year earlier. Of the $17.7 million in software revenue for the second quarter, $9.3 million was operations revenue and $8.4 million was maintenance revenue, compared to $8.1 million and $7.5 million, respectively, of the $15.6 million in software revenue for the second quarter of 2014. The renewal rate for software maintenance in the second quarter was 99.8 percent. The quarterly rate of paging unit erosion improved to 1.6 percent from 2.1 percent in the year-earlier quarter, while the annual rate of unit erosion improved to 6.8 percent from 10.1 percent in the year-earlier quarter. Both the quarterly and annual rates of unit erosion were the Company’s lowest in more than a decade. Net paging unit losses total 19,000 versus 28,000 in the second quarter of 2014. Paging units in service at June 30, 2015 totaled 1,211,000, compared to 1,299,000 a year earlier. The quarterly rate of wireless revenue erosion improved to 1.5 percent from 2.4 percent in the year-earlier quarter, reaching its lowest level in four years, while the annual rate of wireless revenue erosion improved to 9.8 percent versus 11.3 percent in the second quarter of 2014, falling below 10 percent for the first time in more than 10 years. Total paging ARPU (average revenue per unit) was $7.86, compared to $7.98 in the year-earlier quarter and $7.91 in the first quarter of 2015. Consolidated operating expenses (excluding depreciation, amortization and accretion) totaled $38.9 million in the second quarter, compared to $37.4 million in the year-earlier quarter. Capital expenses were $2.0 million, compared to $2.4 million in the year-earlier quarter. Capital returned to stockholders in the form of dividends and share repurchases in the second quarter totaled $2.7 million and $3.0 million, respectively. The Company’s cash balance at June 30, 2015 was $117.1 million. The number of full-time equivalent employees at June 30, 2015 totaled 608, compared to 604 at March 31, 2015. Kelly added that Spok again returned capital to stockholders during the second quarter, distributing cash dividends totaling $2.7 million and repurchasing 177,330 shares of common stock for $3,009,471, or $16.97 per share, under its stock buy-back program. Endsley said the Company is maintaining previously provided financial guidance for 2015, which projects total revenue to range from $183 million to $201 million, operating expenses (excluding depreciation, amortization and accretion) to range from $145 million to $154 million, and capital expenses to range from $5.5 million to $7.5 million. Spok plans to host a conference call for investors on its second quarter operating results at 10:00 a.m. Eastern Time on Thursday, July 30, 2015. Dial-in numbers for the call are 785-424-1666 or 877-876-9177. The pass code for the call is 9775155. A replay of the call will be available from 1:00 p.m. ET on July 30 until 1:00 p.m. on Thursday, August 13. Replay numbers are 719-457-0820 or 888-203-1112. The pass code for the replay is 9775155. Spok’s Annual Meeting of Stockholders will be held on Wednesday, July 29, in Washington, D.C.
Also, Spok has scheduled its annual “Analyst Day” Investor Meeting for financial analysts for November 3, 2015 in New York City. For further details and to RSVP, please contact Stacy Sloan at STACY.SLOAN@SPOK.COM or call 703-269-6950, or send e-mail to INVESTOR.RELATIONS@SPOK.COM. SPOK HOLDINGS, INC., headquartered in Springfield, Va., is proud to be a leader in CRITICAL COMMUNICATIONS for healthcare, government, public safety, and other industries. We deliver smart, reliable solutions to help protect the health, well-being, and safety of people around the globe. Organizations worldwide rely on Spok for WORKFLOW IMPROVEMENT, SECURE TEXTING, PAGING SERVICES, CONTACT CENTER OPTIMIZATION, and PUBLIC SAFETY RESPONSE. When communications matter, Spok delivers. 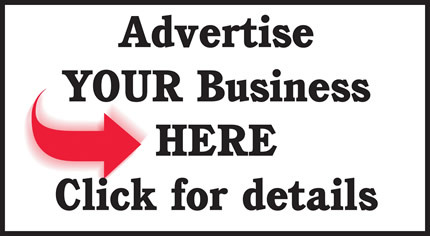 Visit us at SPOK.COM or find us on Twitter @Spoktweets. 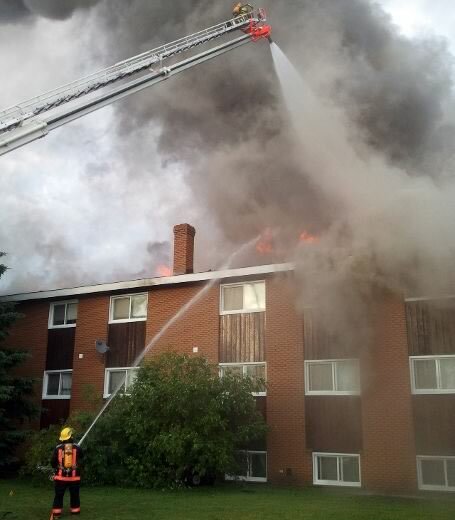 RYAN PAULSEN/DAILY OBSERVER Radio communications for the fire departments across the county and the City of Pembroke, seen here fighting a major apartment fire in 2011, have been problematic and need upgrading, say the Renfrew County Fire Chiefs Association. PETAWAWA — A failure of the communications systems that guide Renfrew County's fire departments during emergency situations could be catastrophic, the town's fire chief is warning council. Presenting a letter on behalf of the Renfrew County Fire Chief's Association, Chief Steve Knott informed councillors that long standing problems, such as redundancy and interoperability, are posing undue risk and significant liability to municipalities. In the correspondence to all municipalities, the association charges that poor reception and dead zones, the lack of interoperability between departments, aging infrastructure, and the inability to provide information digitally during emergencies are just some of the factors plaguing the county's communications system. The June 10 letter was signed by the association's current chair, Renfrew fire chief Guy Longtin, Pembroke fire chief Dan Herback, the co-ordinator of Renfrew County Mutual Aid, and Knott, who chairs the communications committee. "It's becoming a health and safety issue for the firefighters," said Knott. "There are certainly a lot of deficiencies in the system and they have been well documented." The most glaring of all is fire departments rely on a tower at Foymount, located southwest of Eganville, for all their radio communications. Should it go down, they would be left in the dark. Knott explained that while the province provides the communications services through the Ministry of Health and Long Term Care, the hardware is supplied by the county's public works and engineering department. In 1997 when 911 came online, all call taking, paging and dispatching for municipal fire services were modified so that they came out of a single communications agency. Lower tier municipalities are invoiced by the county for each fire/dispatching service. "It's up to each individual municipality to make sure their fire department has the proper equipment," said Knott. "We think there is a definitely a liability here." It is not a new issue, the chief noted. In 2004, a presentation was made to the county's health committee. Then as recently as 2013, the county paramedic chief Michael Nolan, who is also the director of emergency services, commissioned an analysis from Murphy and Associates Emergency Management Consulting to conduct a comprehensive examination of the communications systems and calls for service. The firm concluded that, "There is factual and evidential information both historically and currently that identified the radio system infrastructure as the most prominent and imminent risk for a catastrophic single point of failure for fire and emergency services in the County of Renfrew." According to the fire chiefs, this report has never been presented to County council. Knott pointed out that other counties are upgrading their communications infrastructure. For instance, the United Counties of Leeds and Grenville are incorporating a digital simulcast and paging system and Lanark County has gone to an analogue repeater system. Mayor Bob Sweet anticipated the joint letter will bring the issue of communications back into focus at County council adding he intends to raise the matter at the August meeting of the operations committee. "This is something that has to be taken care of," said Sweet. With no action in the past 11 years, Councillor Treena Lemay wondered how long it would take for the county to address these pressing concerns. "When are we going to come to the end and when are we going to come to a solution," said Lemay. Courtesy of GCSAR Flight For Life, pictured here during an earlier rescue, was instrumental in saving a man experiencing severe altitude sickness at Bowen Lake in the Neversummer Range on Tuesday, July 28. 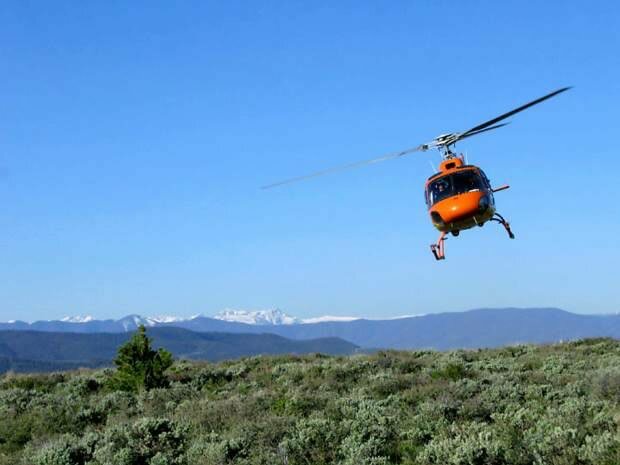 Grand County Search and Rescue was paged at 4:54 a.m. Tuesday, July 28, for a 20-year-old male, at Bowen Lake with probable altitude sickness at the 11,400-foot high lake. 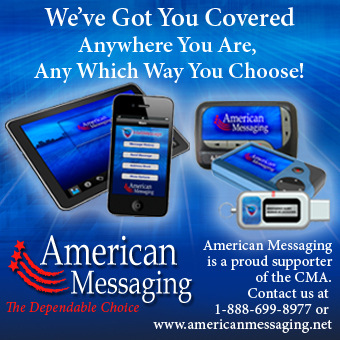 The Grand County Sheriff’s Office was alerted through a Delorme “In Reach” two way satellite paging\texting device. This device is different than the PLB (personal locator beacon) used during last week’s mission in the Meadow Creek area. The Delorme device gives an exact GPS location and allows for two way communication through a third party rescue center. The subject was attending an “adventure camp” and was in the field for multiple days. The group leader had planned to walk out at first light, and hike seven miles back to the trailhead. Searchers communicated back to the group and “ordered” them to stay put and await medical assistance. The subject was exhibiting signs of HAPE (High Altitude Pulmonary Edema), including a crackling chest. This is not common and is potentially deadly. After conferring with the Sheriff’s Office, Search and Rescue Incident Commander, Mike Leiser, decided to page the team and Grand County EMS Mountain Medical Response Team in preparation for the ascent to Bowen Lake. During this time, Flight for Life Colorado airship, code name Lifeguard 1, was called to launch and fly directly to the subject in an effort to immediately render medical aid. Lifeguard 1 was able to land in a small open area near the subject, pick him up and make a quick exit for the hospital. The medical crew used a pulse oximeter to measure the subject’s oxygen saturation level, which normally would be approximately 90 percent at 10,000 feet. His level was just 54 percent. Recognizing the immediate danger of hypoxia; the flight nurse and paramedic administered oxygen at a very high rate. At last report the subject was out of immediate danger. Had the group attempted to walk out unaided, or rescuers and medical personnel could not reach him in time; the subject would probably have had catastrophic medical issues and may not have survived the trip down. “Working together; we probably saved a life today,” said Incident Commander Leiser. Grand County Search and Rescue is a nonprofit, all-volunteer, professional rescue organization, accredited by the Mountain Rescue Association, providing four-season emergency back county service in Grand County at no charge to residents or guests. Find GCSAR online at www.facebook.com/GCSAR. SPRINGFIELD, Va., Jul 29, 2015 (BUSINESS WIRE) — Spok Holdings, Inc. SPOK, a global leader in critical communications, today announced the election of Stacia A. Hylton to its Board of Directors at the Company’s Annual Meeting of Stockholders, expanding the Board from seven to eight directors. Hylton recently retired as Director of the United States Marshal Service (USMS), a federal law enforcement agency within the United States Department of Justice. She was nominated by President Barack Obama and confirmed by the United States Senate in 2010. USMS, with more than 5,400 employees, is responsible for judicial security, fugitive operations, asset forfeitures, prisoner operations and transport and witness security. Previously, she was President of Hylton, Kirk & Associates, a Virginia-based private consulting firm, and served as Federal Detention Trustee in the United States Department of Justice. From 1980 to 2004, Hylton served in progressively responsible positions within USMS. 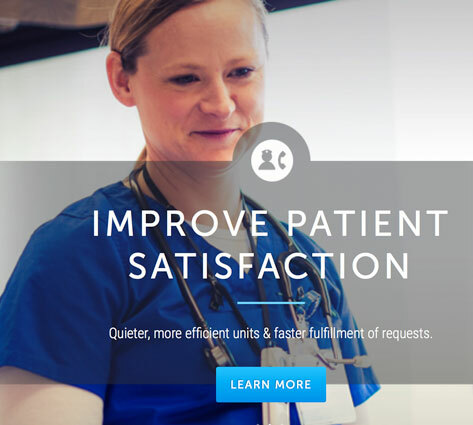 Spok Holdings, Inc., SPOK, headquartered in Springfield, Va., is proud to be a leader in critical communications for healthcare, government, public safety, and other industries. We deliver smart, reliable solutions to help protect the health, well-being, and safety of people around the globe. Organizations rely on Spok for workflow improvement, secure texting, paging services, contact center optimization, and public safety response. When communications matter, Spok delivers. Visit us at spok.com or find us on Twitter @Spoktweets. SYDNEY — Citizens who like listening in on police, fire department and ambulance calls are out of luck, now that most emergency services communications in Cape Breton are conducted on fully encrypted radios. The scanners have gone silent, for the most part, with the introduction of the second generation of Trunk Mobile Radio (TMR2) communications. Being unable to monitor police traffic can be dangerous for citizens, said one longtime listener who didn’t want to be named. “You don’t know what’s going on in the city unless you have a scanner,” said the citizen, who lives in Sydney’s north end. Recently, police were looking for a man seen on Dolbin Street, who reportedly had a gun. Thankfully, people listening to scanners were able to alert neighbours to stay inside, the citizen said. “Certain things cannot be aired over the scanner, of course. It’s common logic. But they shouldn’t be blocking everything out. The citizen said no one has yet heard of a way to crack the new encryption. “I was hoping you would have heard,” the listener said. Cape Breton Regional Police spokeswoman Desiree Vassallo said police haven’t heard any complaints from citizens about the encryption system. She said police need secure communications, especially during sensitive operations when police don’t want suspects or the public to know exactly where they are. Listeners can still occasionally hear some fire department traffic, because the Cape Breton Regional Municipality’s volunteer fire departments only have four radios each, for now. 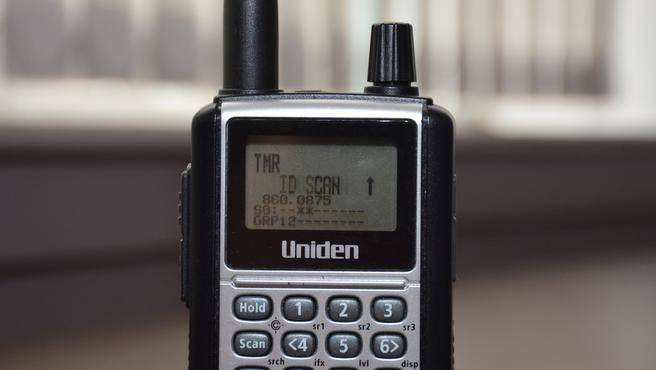 The municipality is considering buying more radios for volunteers, but for now, fire department commanders use the TMR2 radios to talk to the dispatch centre and other emergency personnel, such as the police and ambulance services. The commanders then communicate with individual firefighters using the older very-high-frequency (VHF) radios, which scanners can pick up. That means listeners may hear some radio traffic, but not necessarily the most critical information, such as the location or severity of a fire or emergency scene. Fire Chief Bernie MacKinnon said encryption is not important for fire departments, in part because fires are usually obvious and people can phone their neighbours or put messages out on social media anyway. “TMR2 encryption is a police animal,” he said. However, he said, maintaining clear communications with other emergency services is important. Whether the service outfits all volunteer firefighters with the new radios is still under discussion, said MacKinnon, but it’s likely both VHF and TMR2 radios will be used for some time to come. “To the best of my knowledge, outside of Halifax, all the other departments are running a hybrid system of using VHF in combination with TMR,” he said. The State Wide Interoperable Communications Enhancement Act, or SWIC Enhancement Act (HR 2206), passed by the House would require states to have a Statewide Interoperability Coordinator (SWIC) or to delegate activities related to achieving interoperability to other individuals. The author of the bill, Rep. Donald M. Payne, Jr. (D-NJ), ranking member of the House Committee on Homeland Security Subcommittee on Emergency Preparedness, Response and Communications, said Monday afternoon, “Lack of interoperable communications impedes the ability of first responders to carry out effective responses to emergency situations. When first responders can’t communicate with one another, their ability to coordinate life-saving activities becomes jeopardized." SWICs are also responsible for leading all coordination efforts, including statewide planning, and developing a strategic vision for interoperability. Earlier this month, another bill authored by Payne, the DHS Interoperable Communications Act (HR 615) was signed into law by President Obama which requires DHS’s Under Secretary for Management to maintain interoperable communications among the components of the department. Under the new law, DHS is also required to create and submit to Congress a strategy to achieve department-wide interoperable communications that includes known interoperability challenges and gaps and projected milestones. 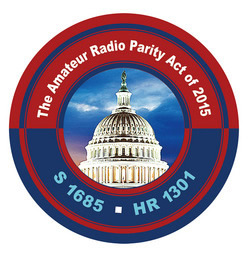 ARRL Headquarters has forwarded 3433 letters to 402 individual US House members, seeking their co-sponsorship of H.R. 1301. The nascent campaign on behalf of the identical US Senate bill, S. 1685, has so far garnered more than 900 letters destined to 77 individual US Senate members. To help maintain the momentum, many ARRL Division Directors have been taking a letter-generating tool to conventions and hamfests. The ARRL has filed three more complaints with the FCC, urging its Enforcement Bureau to investigate and initiate enforcement proceedings to halt the marketing and retail sale of certain RF lighting devices, typically known as "grow light" ballasts, which, it said, violate FCC Part 18 rules. The largely identical complaints zeroed in on three specific products: The Galaxy Legacy Selective Wattage Ballast, the Quantum Horticulture HPS/MH-600W RF Lighting Ballast, and the Lumatek "Dial-a-Watt Air-Cooled" 1000 W Ballast. The League had complained to the FCC in March 2014 about another Lumatek product, and noted that "apparently nothing has been done to date" in that case. The ARRL asserted that the three devices targeted in its most recent complaints generate "blatantly excessive conducted emissions." Further, the League alleged, the devices are being marketed and sold illegally — in both instances in violation of FCC Part 18 rules. Supporting all three complaints were detailed reports from the ARRL Laboratory that quantify the League's emission level concerns. Services like Hangouts, Facebook Messenger, and WhatsApp offer so many advantages over the antiquated method of text messaging. Messaging is probably one of the most common tasks you perform on your smartphone. So, like anything else, you should seek out the best apps and services to do it. That means making the break with standard text messaging, or SMS. It’s actually a rather old technology, harking back to the days of the flip phone. But like the fax machine and landlines, it’s managed to stick around. Part of that is convenience. Put someone’s phone number in your contacts and then just text away. But all the innovation and extra features that come with apps like Hangouts or Facebook Messenger are hard to ignore: you can share your location in real-time, sync up the conversation with desktop apps, and stay in touch over Wi-Fi if you are without a cell signal. Pushing your friends onto a messaging service remains the biggest challenge, but it’s worth the effort (well depending on your friends). Here are a few thoughts on why using one of the many instant messaging apps offers a compelling alternative to text messaging. SMS stands for Short Message Service. It’s a standard communication platform built for for early days of mobile communication, when texting someone meant flipping open your phone and trying to communicate with the buttons on the dial pad. Messages were also capped in length at 160 characters (barely more than a tweet). 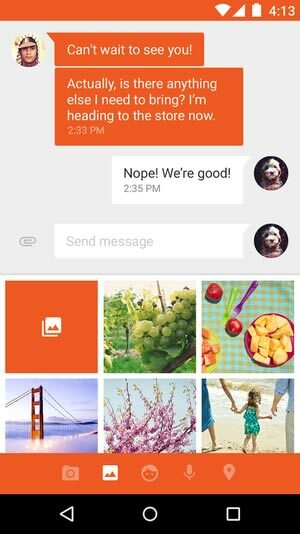 That limitation remains in effect, though a modern text messaging apps will turn longer messages into an MMS (Multimedia messaging) in order to workaround that limitation. It's part of the GSM protocol and doesn't require a data connection. Instant messaging works differently. Messages are sent over the 'net and through the servers of whichever company runs the service. As such, you just need an Internet connection to communicate, whereas with SMS your device needs to be connected to a cellular network. This is why IM was first popularized on desktop computers by services like AOL’s AIM, ICQ, and eventually Google Talk, which was the forerunner to Hangouts. 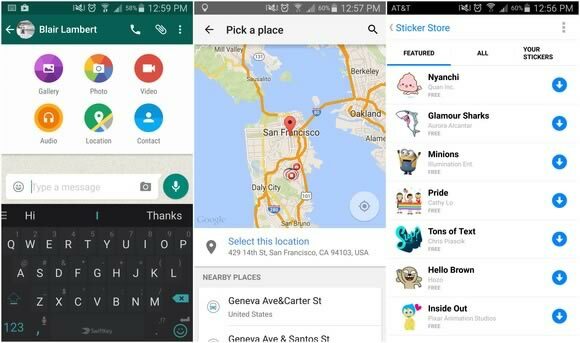 Though IM has been on Android a while, Google’s most ambitious foray was through Hangouts. There are plenty of competitors, as being the hub for all your communication gives these companies a chance to hook you to their ecosystem. Fortunately, this competition has brought about a lot of innovation in the messaging space. These mobile messaging apps are frequently called "over-the-top" (OTT) messaging, as the services operate on the Internet as an alternative to what is offered by your carrier. Read notification: Many apps give some type of indication as to whether or not the recipient has read the message, usually through a small icon in the conversation view. It’s great for letting you now you may have to bug that particular person again if they didn’t read your message. Some will also show you when someone is replying, before the message comes through. Location sharing: As an example, with Hangouts when someone asks, “where are you?” the app will automatically offer to share your location. It’s a slick feature, though Hangouts isn’t the only app to send your current place in the world. This type of tool is a handy way to find out if someone is going to be late for that meetup. Seamless conversations: Conversations can get disjointed when you switch from chatting on the desktop via IM to texting on the phone. 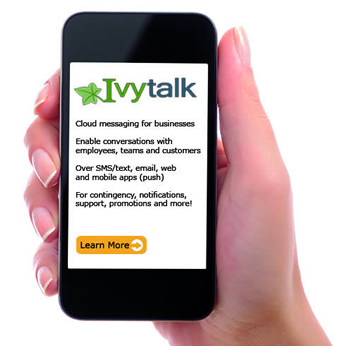 Using an instant messaging app adds a good flow to the conversation because you can pick up from where you left off. This is the strength of Apple’s iMessage, of course. But since it’s iOS-only, you’ll need to pick your favorite Android alternative. No need for a cellphone connection: Using a Wi-Fi connection to message people is particularly helpful if you’re out of the country or in a spotty coverage area. Unless your carrier lets you text out of the country, an IM app is the best chance at keeping you connected to others. Stickers: Who doesn’t like stickers? Many apps go beyond the Emoji with a bunch of zany characters that sometimes are the best way to get an idea across. If nothing else, they can liven up a boring day at the office. Which service you use the most may depend on several different factors. Some are super popular overseas, like WhatsApp and WeChat. If you are heading across the pond or have friends on other continents you may find that this is the best way to get a hold of them. 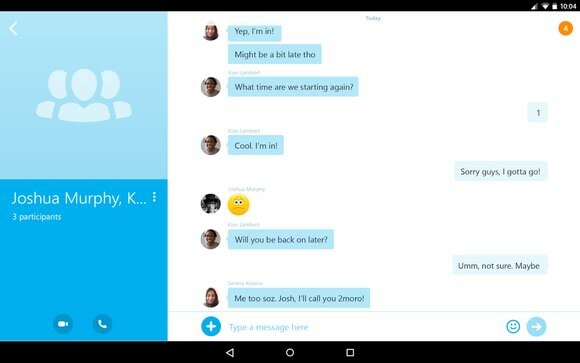 Skype remains a popular method for instant messaging with others. Here in the U.S., everyone’s access to Facebook, and the social network’s plans to build its app into an eCommerce platform, makes it a must-have. Skype remains a powerhouse in video chat, and the instant messaging component can make it convenient if you need to follow up after a call. 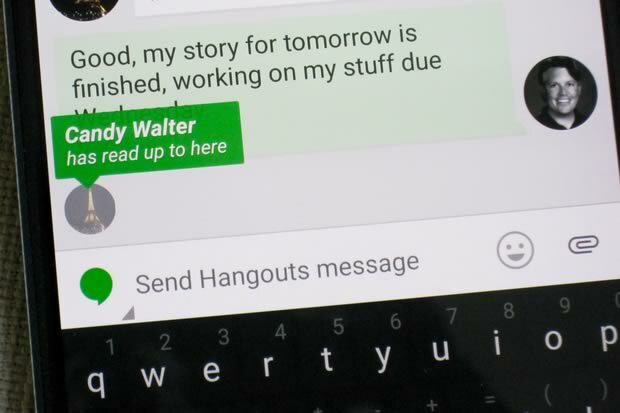 A few of my hard-core Android friends swear by Hangouts, so I use that as much as possible. You may have noticed one thing about the solutions outlined here: there are way too many. Some of this is Apple’s fault—by keeping iMessage proprietary to Apple devices, iPhone users will forever stick to the Messages app, which means ugly green messages (standard SMS/MMS) to Android users. The best hope is that Google makes Hangouts more attractive, which could mean more users. Facebook’s efforts into Messenger, and the fact that just about everyone is on Facebook, make it a good option. You probably can’t (or don’t need to) completely escape SMS, but you’ll find the conversations easier to follow if you do. Derek Walter Derek Walter is a freelance technology writer based in Northern California. He is the author of Learning MIT App Inventor, a hands-on guide to building your own Android apps. The BloostonLaw Telecom Update newsletter will be on our traditional August recess, in light of the usual slowdown in the news cycle at this time of year. We will resume publication on September 3. Meanwhile, we will keep clients apprised of significant developments via memos and special supplements. On July 24, the FCC officially granted the AT&T-DirecTV merger, about which Chairman Wheeler issued an initial statement last week. According to the Order, AT&T will acquire DirecTV in a stock-and-cash transaction in which each share of DirecTV common stock will be converted into $28.50 in cash plus the right to receive between 1.724 and 1.905 shares of AT&T common stock, depending on AT&T’s stock price prior to closing. At closing, DirecTV will merge with and into a wholly owned subsidiary of AT&T, Steam Merger Sub LLC, which will be the surviving entity and will be renamed “DIRECTV.” The new DIRECTV will own the stock of the subsidiaries of the pre-transaction DIRECTV, and these subsidiaries will continue to hold the FCC licenses and other authorizations they held prior to the transaction. Fiber to the Premises (FTTP) Deployment. Post-merger AT&T-DirecTV must expand FTTP service to 12.5 million customer locations. Gigabit Service to E-rate Eligible Schools and Libraries. AT&T-DirecTV must offer gigabit service to any E-rate eligible school or library where AT&T deploys FTTP service. Non-Discriminatory Usage-Based Practices. AT&T-DirecTV must refrain from imposing discriminatory usage-based allowances or other discriminatory retail terms and conditions on its broadband Internet service. Internet Interconnection Disclosure Requirements. AT&T-DirecTV must submit its Internet interconnection agreements to the FCC so that the FCC may monitor the terms of such agreements to determine whether AT&T is denying or impeding access to its networks in anticompetitive ways through the terms of these agreements. Discounted Broadband Services for Low-Income Subscribers. AT&T-DirecTV must make available an affordable, low-price standalone broadband service to low-income consumers in its broadband service area. Compliance Program and Reporting. AT&T-DirecTV must retain both an internal company compliance officer and an independent, external compliance officer that will report and monitor, respectively, the combined entity’s compliance with all conditions of the merger. approaches for providing increased transparency of FCC procedures and protocols, and practices to track, disclose and encourage prompt Commissioner votes on items on circulation. No filing deadline was listed, which means the opportunity to comment could end at any time. Clients interested in filing comments on the FCC internal process reform should contact the firm for more information. The Commission has just suspended until further notice the August 3 comment deadline for the NPRM in the Incentive Auction Vacant Channels proceeding (MB Docket 15-146). The June 11 NPRM (FCC 15-68) tentatively concluded that the Commission would preserve at least one vacant UHF band TV channel in each geographic service area for white space devices and wireless microphones. In addition to this vacant TV band channel, unlicensed users will be able to conduct operations in whatever guard bands are needed to accommodate the paired 600 MHz band plan for mobile service (which will vary from market to market based on the participation level of broadcasters in the incentive auction) and in the 11 megahertz duplex gap that exists between the 600 MHz mobile uplink and downlink bands. Google and Intel and other large white space and unlicensed spectrum advocates have consistently urged the Commission to ensure that a significant amount of unlicensed spectrum will be available in the TV Bands after the incentive auction and repacking of broadcasters has been completed. However, LPTV, TV translator and Broadcast Auxiliary Service stations, which are important operations but which are licensed with secondary status in the TV bands, were seemingly left out of the discussion, and some advocates have argued that these vital services may be irreparably harmed and their substantial investments impaired by the Incentive Auction process. Per the FCC Order (DA 15-867), which was adopted and released this afternoon, the National Association of Broadcasters (NAB) is requesting that the Commission suspend the comment and reply comment deadlines for the Vacant Channels NPRM until further notice. NAB's motion for extension of time argues that an extension is necessary because if the Commission decides to allow a limited number of broadcast TV stations to be reassigned to channels within the duplex gap, this could impact the use of this spectrum by white space devices and wireless microphones. The possibility that even just a few TV broadcast operations may be relocated to the duplex gap in just a handful of markets has a wide array of commenters, and especially broadcasters, up in arms. The FCC says "animated," but under the circumstances it may have been more appropriate to say “agitated.” Either way, the comment and reply deadlines on the Vacant Channels NPRM are suspended until further notice. Depending on the outcome of the pending proceeding, the LPTV industry may consider a challenge to the Incentive Auction rules if the FCC doesn't listen to and address the concerns of incumbent operators, even if they are operating on secondary status. Regardless of the merits, a judicial challenge could very well delay or add uncertainty to the planned start date for the auction in early 2016. As we noted in the last BloostonLaw Telecom Update, the FCC is scheduled to vote on an Auction Procedures Public Notice next week. If adopted in its current form, the PN would set Tuesday, March 29, 2016 as the official start date for the Broadcast Incentive Auction. What does this mean? After more than 20 years, the Commission has determined that there is a significant need to change the way its Enforcement Bureau conducts business. In large measure, this initiative is the result of significant technological changes over the years and limited tax dollars. The FCC has stated that this reorganization should not be perceived as a step-back from its enforcement activities. Rather, the reorganization of its field offices is intended to align the Enforcement Bureau structure and operations with the FCC’s priorities, including the elimination of radio frequency interference. However, some industry members have expressed concern that it may become more difficult to get the Commission’s attention in the event of an interference problem. 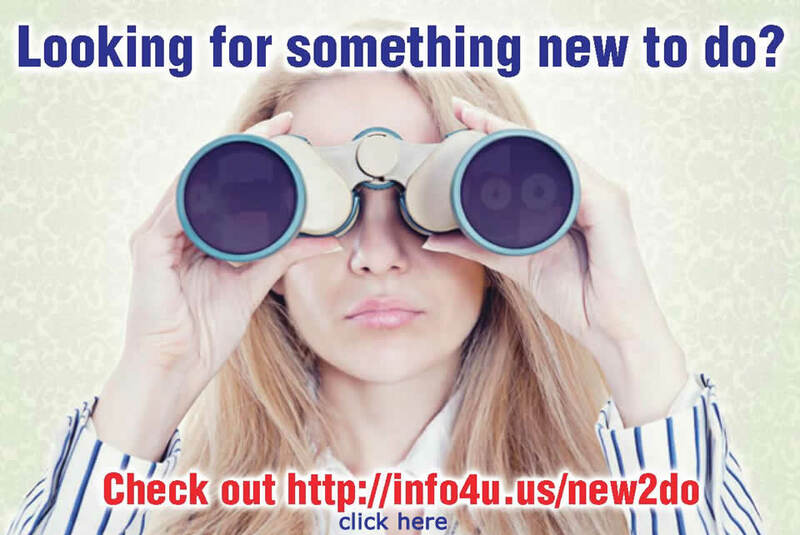 As part of the reorganization, the FCC is changing the qualifications for its field agents and realigning its offices. Of significance, all field agents will now be required to be electrical engineers. While the FCC will continue to operate offices in Atlanta, Boston, Chicago, Columbia, Maryland, Dallas, Denver, Honolulu, Los Angeles, Miami, New Orleans, New York, Portland, Oregon and San Francisco, it will be closing its offices in Anchorage, Buffalo, Detroit, Houston, Kansas City, Norfolk, Virginia, Philadelphia, San Diego, San Juan, Seattle and Tampa. In order to make up for these office closures, the FCC will rotate field agents through Anchorage, San Juan and Kansas City on a periodic basis. Finally, the FCC will also base rapid deployment or strike teams in Denver and Columbia, Maryland in order to supplement enforcement efforts at the remaining field offices as well as support high-priority enforcement actions. On July 23, the FCC’s Enforcement Bureau issued a Forfeiture Order to GPSPS, Inc. assessing a fine of over $9 million for cramming, slamming, and submitting falsified evidence to government regulatory officials as proof that 41 consumers had authorized the company to switch their long distance providers. As we reported in the March 4 edition of the BloostonLaw Telecom Update, the Bureau reviewed more than 150 complaints against GPSPS that consumers filed with the Commission, the Federal Trade Commission (FTC), the Public Utility Commission of Texas (Texas PUC), and the Better Business Bureau (BBB). All complainants contended that GPSPS switched their preferred long distance service provider without their authorization, and most affirmatively asserted that they had never heard of or spoken to GPSPS before discovering GPSPS’s charges on their telephone bills. Some complainants indicated that GPSPS told them the company had audio recordings evidencing the authorization and that, upon hearing those recordings, contended they were fake. GPSPS also apparently failed to respond full and in a timely manner to the Bureau’s investigation. On July 22 the Senate appropriations subcommittee voted on a broad funding measure that, among other things, prohibits the FCC from regulating rates under the net neutrality order. The bill would also cut the FCC’s funding by $20 million from last year’s funding. It will be voted on by the full committee on Thursday; however, it must still be signed by President Obama before becoming law — a very unlikely possibility given the President’s vocal support for Net Neutrality. As we reported in the June 17 edition of the BloostonLaw Telecom Update, a bill was passed by the House Financial Services Subcommittee would impose the same spending restriction, cut the FCC budget by $25 million, requires newly proposed regulations to be made publicly available for 21 days before the Commission votes on them, and prohibits the FCC from regulating rates for either wireline or wireless Internet service. The news source reports that a recent investigation it had conducted found that “roughly half of the nearly 300 projects RUS approved as part of the 2009 Recovery Act have not yet drawn down the full amounts they were awarded” and that “[m]ore than 40 of the projects RUS initially approved never got started at all, raising questions about how RUS screened its applicants and made its decisions in the first place.” The canceled projects amounted to approximately $300 million in loans and grants, and approximately $277 million in awarded funding remains to be drawn (with any money that is not drawn by the end of September being forfeited, possibly stranding the amounts already drawn in unfinished projects). AUGUST 1: FCC FORM 499-Q, TELECOMMUNICATIONS REPORTING WORKSHEET. All telecommunications common carriers that expect to contribute more than $10,000 to federal Universal Service Fund (USF) support mechanisms must file this quarterly form. The FCC has modified this form in light of its recent decision to establish interim measures for USF contribution assessments. The form contains revenue information from the prior quarter plus projections for the next quarter. Form 499-Q relates only to USF contributions. It does not relate to the cost recovery mechanisms for the Telecommunications Relay Service (TRS) Fund, the North American Numbering Plan Administration (NANPA), and the shared costs of local number portability (LNP), which are covered in the annual form (Form 499-A) that was due April 1. BloostonLaw contacts: Ben Dickens and Gerry Duffy. 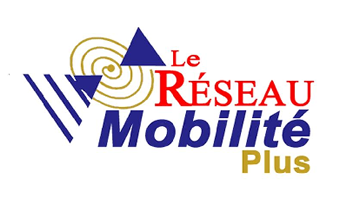 Providers of Mobile Telephony Services: Facilities-based providers of mobile telephony services must complete and file the applicable portions of this form for each state in which they serve one or more mobile telephony subscribers. A mobile telephony service is a real-time, two-way switched voice service that is interconnected with the public switched network using an in-network switching facility that enables the provider to reuse frequencies and accomplish seamless handoff of subscriber calls. A mobile telephony service provider is considered “facilities-based” if it serves a subscriber using spectrum for which the entity holds a license that it manages, or for which it has obtained the right to use via lease or other arrangement with a Band Manager. Aug. 17 – Comments on Lifeline Further Notice of Proposed Rulemaking are due. The applicant uses ASR Certification Option No. 4 (asserting that the FCC has issued a Finding of No Significant Impact before the FCC has issued such finding). In order to avoid the potential for monetary forfeitures, it is very important that our clients ensure that their ASR filings are made in a timely manner and in compliance with the FCC’s environmental rules. We recommend that clients consult us with any questions, or have us assist with preparation of their filings, to avoid fines. What does this mean? After more than 20 years, the Commission has determined that there is a significant need to change the way its Enforcement Bureau conducts business. In large measure, this initiative is the result of significant technological changes over the years and limited tax dollars. The FCC has stated that this reorganization should not be perceived as a step-back from its enforcement activities. Rather, the reorganization of its field offices is intended to align the Enforcement Bureau structure and operations with the FCC’s priorities, including the elimination of radio frequency interference. However, some industry members have expressed concern that it may become more difficult to get the Commission’s attention in the event of an interference problem. For our clients, the danger is that the Bureau may seek to “magnify” the impact of its reduced enforcement capability by really clobbering those entities that are caught in a violation, especially smaller companies that are less likely to mount a serious legal challenge. The FCC is seeking comment on the Land Mobile Communications Council’s (LMCC’s) proposed 800 MHz Interstitial Channel Interference contours in connection with the Commission’s ongoing800 MHz rule making proceeding. Comments are due 30 days after publication in the Federal Register. Essentially, LMCC has proposed interference contours that would apply when stations of various modulation types are operated on the interstitial channels (12.5 kHz spacing) adjacent to the “standard” 25 kHz spacing stations that are also operated with various modulation types. LMCC first made its proposal in 2010, but due to significant changes in equipment offerings over the past 5 years, determined that the interference criteria in its original proposal were no longer adequate. Please contact us if you would like to review a copy of the LMCC proposal. Kathrein Automotive GmbH & Ko. has filed a request for waiver of the FCC’s Consumer Signal Booster anti-oscillation and labeling requirements in order to permit the certification of in-vehicle, pre-installed Wideband Consumer Signal Boosters. The FCC’s rules currently require that Consumer Signal Boosters self-monitor and mitigate any unintended uplink and downlink oscillations. Alternatively, Kathrein requests that the FCC determine that its signal booster complies with the FCC’s Rules, through the use of protection measures that are equivalent to the Network Protection standard. Kathrein is also requesting a waiver of the labeling requirements for Consumer Signal Boosters – in particular, that the labeling be on the device packaging and on the device itself, since the device will be installed in vehicles by the vehicle manufacturer. Instead, Kathrein proposes that the vehicle manufacturers provide the necessary advisories to their customers at the time that a signal booster equipped vehicle is sold. Comments in this proceeding are due August 10, 2015; Reply Comments are due August 20, 2015. The FCC has granted a waiver of Rule Section 90.617 in order to permit the assignment of various 900 MHz frequencies in the Industrial/Business Pool by the Suburban Mobility Authority for Regional Transportation (SMART) to Oakland County, Michigan. A rule waiver was required because Oakland County, as a local government, is not eligible to hold this spectrum. Pursuant to Rule Section 90.421, SMART authorized the County’s Road Commission to utilize some of SMART’s 900 MHz spectrum since the Road Commission was available to assist SMART in emergencies and so that both entities could communicate. In this regard, SMART arranged for the County’s Road Commission to install several hundred 900 MHz mobile data units in the Commission’s vehicles so that SMART could communicate with these vehicles, in order to determine the relevant road conditions. Because SMART is migrating its operations away from the 900 MHz band, it has proposed to assign to the County those 900 MHz frequencies it is currently using, while deleting those channels that are not being used. In granting the rule waiver, the FCC noted that the County’s long-time use of the industrial 900 MHz channels was consistent with the FCC’s rules and that SMART’s action to delete those channels not used by the County would make that spectrum available to other industrial users. Yesterday, the United States District Court for the Southern District of New York granted summary judgment against Time Warner Cable for violations of the Telephone Consumer Protection Act of 1991 (the “TCPA”), which prohibits the placement of calls by an automated dialing machine without prior consent of the called party. The plaintiff, Ms. Araceli King, was awarded $229,500 – 153 violations at $1,500 per violation. The FCC has since clarified the TCPA rules to make it more clear that when a company is sloppy about calling a customer number that has been reassigned (or customer consent has been revoked), it will face steep penalties. Time Warner also argued that only calls that actually connected – in this case, around 70 – could possibly violate the TCPA. Here, the court ruled that the plain language of the statute makes it unlawful to make any call using an automated dialing system – whether the call is answered by a person, a machine, or not at all is irrelevant. Finally, Time Warner argued that it placed the calls with the consent of the consumer. Specifically, Time Warner argued that (a) the plaintiff had consented through her agreement with the company and (b) it thought it was calling a Mr. Luiz Perez, whose consent it had also obtained. However, after a few months of calls, the plaintiff informed a Time Warner representative that she was not Mr. Perez, and asked the company to stop calling her. The court found that this constituted revocation of consent, and that all calls placed after the revocation (153) were violations of the TCPA. The FCC has issued a Notice of Apparent Liability against Mobile Relay Associates (MRA) for causing harmful interference to co-channel licensees. In particular, the FCC determined that MRA failed to (a) monitor before transmitting on shared frequencies and (b) take other precautions in order to avoid causing harmful interference to another licensed co-channel station. Following an inspection of MRA’s station, the FCC notified MRA of the monitoring requirement. However, it appears that MRA failed to modify the operation of its station in order to remedy the interference issue. As a result, the FCC has proposed a $25,000 fine. In response to interference complaints, the FCC’s Los Angeles Office investigated the MRA station on several occasions and found that MRA was operating its station on nearly a continuous basis with a 96 to 97 percent and did not restrict its transmissions to the minimum time required. Additionally, the FCC noted that MRA did not operate the station in a trunked configuration even though the MRA license only authorized trunked operations. The FCC’s Rules clearly outline the obligations that licensees have to avoid causing harmful interference. These obligations are especially critical because the channels are shared. In particular, Rule Section 90.403 (e) requires licensees to take reasonable precautions to avoid causing harmful interference. This includes monitoring the frequency for communications that are in progress before transmitting, and other measures in order to prevent harmful interference to other licensed co-channel operations. Because most of the Part 90 private radio channels are shared, it is important to configure your system so that it does not cause harmful interference to other authorized users. This means that you should monitor, and also ensure that communications are kept to the minimum time required and that your stations do not monopolize the airwaves. 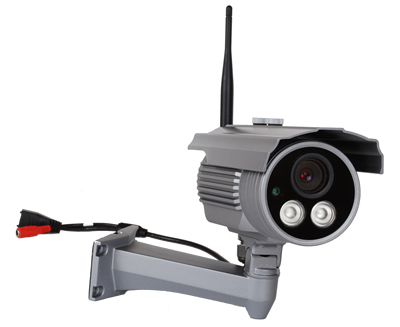 Any client with questions regarding the appropriate configuration for their system should contact our office. The FCC has granted Avon Grove Regional Emergency Management’s application to construct a new Travelers Advisory Station in Chester County, Pennsylvania. This grant is significant because the FCC waived its rules which restrict the height of the antenna to 15 meters and the field strength to 2.0 m V/m at a distance of 1.5 km from the transmitter site. In requesting its waiver, Avon noted that the Travelers Advisory Station is dual purpose, since it is also designed to provide emergency information to the community in the event of a disruption in electrical service. As part of its station design process, Avon Grove tested its antenna at various locations using the 15 meter antenna height, but found that the signal distortion from an adjacent antenna tower limited its ability to provide adequate coverage in all directions. Avon Grove provided engineer statements which demonstrated that it would not cause harmful interference to an adjacent channel AM broadcast station in Lindenwold, New Jersey. The FCC conditioned its grant upon the stipulation that Avon Grove may not cause any interference to an AM broadcast station and must accept any interference. The FCC has updated its Experimental Radio Service (ERS) rules to provide licensees with additional flexibility to keep pace with technical changes. In particular, the Commission has added three new types of experimental licenses: (a) the program license, (b) the medical testing license and (c) the compliance testing license. Additionally, the FCC also modified its market trial rules in order to make its policies clearer. The FCC has modified its rules in response to three petitions for reconsideration, as follows: (a) consistent with past practice, the FCC will permit conventional ERS licensees and compliance testing licensees to use frequency bands that are allocated for passive services under certain circumstances; (b) clarified that licensees may recover some costs from end users for the testing and operation of experimental medical devices during clinical medical trials under the FCC’s market trial rules and (c) added a new definition for “emergency notification providers” in order to clarify that all participants in the FCC’s Emergency Alert System (EAS) are emergency notification providers. Confusion exists because FDA and FCC cost recovery rules for medical trials differ. Generally, the FCC’s rules prohibit the operation and marketing of RF equipment before an equipment authorization is issued – except in limited circumstances, such as pursuant to an experimental license with “market study” authority. The restrictions on marketing are intended to prevent the distribution and sale of experimental devices in the general stream of commerce where devices may not be easily recalled by the manufacturer or distributor. The question became whether accepting FDA authorized reimbursements would fall under the FCC’s definition of marketing. While the FCC noted that it would, it also concluded that the market trial exception under Part 5 of the FCC’s Rules would apply. As a result, the FCC has clarified that medical device manufacturers may recover their costs to the extent permitted by the FCC’s Part 5 market trial rule. The Commission has added a definition of “Emergency Notifications” to its rules and now clarifies that “all participants in the Emergency Alert System are emergency notification providers, and are therefore entitled to notification of program experiments that might affect them, as well as protection from harmful interference that such experiments might cause.” The underlying Report and Order specified that for program license experiments that might affect critical service bands (i.e., bands used for the provision of commercial mobile services, emergency notifications or public safety purposes), the program licensee would be required to take the additional step of developing a specific plan to avoid causing harmful interference. 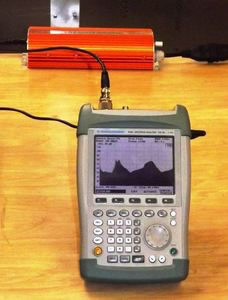 The FCC has proposed to modify it program rules in order to permit experimentation on frequencies listed in Rule Section 15.205(a), provided that the device being tested is designed to comply with all applicable service Rules under Parts 18 – Industrial, Scientific and Medical Equipment; Part 95 – Personal Radio Services Subpart H – Wireless Medical Telemetry Service or Part 95 Subpart I – Medical Device Radio Communication Service. The FCC believes that the proposed changes will establish parity between all qualified medical device manufacturers when conducting clinical trials with RF based medical devices as it related to permissible frequencies. Comments will be due 30 days after publication in the Federal Register; reply comments 45 days after publication in the Federal Register. Mark your calendars to join us and stay informed. We are going back to the beach! Myrtle Beach that is, where CMA began to host its annual conventions. A few years ago, CMA-A voted to alternate annual meetings between hosting in the U.S. and hosting overseas. We have been doing this and hope you will consider registering to attend our annual joint Convention with CMA-E at the Hilton Prague Old Town, September 30 - October 2, [....]. However, we recognize a trip to Prague, while incredibly valuable, may be unrealistic for a myriad of reasons for many of you. Therefore, we are excited to announce a “going back to our roots” opportunity for education and informal networking in Myrtle Beach, SC. We need your ideas on key items that you would like to hear/discuss with one another. Our focus will be on small business issues and challenges. We need you to attend. We will keep costs minimal for travel, lodging and registration. More details will follow shortly on cost and specific hotel location. In the meantime, please let Linda (linda@criticalmessagingassociation.org) know if you plan to attend and most importantly, what would make this a valuable experience for you. A large crowd of people gather to watch the Cuban flag being raised outside the Cuban embassy in Washington on July 20, 2015.